I was thinking about how to toast a marshmallow and a complete s’more all on one stick. I was trying to figure out a way to make the chocolate softer, other than just waiting for the marshmallow itself to heat up the chocolate, and how to get the graham crackers warm too. All of us love sitting around the campfire, but sometimes when it’s your main family tradition and you have a dad who is constantly coaching you on how to roast the perfect s’more, out of that comes the inspiration to make a s’more in a whole new way. I decided to try toasting it on the Rolla Roaster and felt like I had discovered gold! My dad was so proud too. This is what happens when you’re from a family of campfire enthusiasts. Most exciting of all, this is one more way the Rolla Roaster is making campfires revolutionary and you can’t roast marshmallows on sticks this way, has to be custom made on the Rolla Roaster! Here is a video to show you how you can do this. For those of you who like to burn their marshmallows this way of campfire cooking will not work for you but for those who like the marshmallows nice golden brown, it’s perfect! Then push the marshmallow to the bottom of the fork. Take about a block of about 3 heresy’s squares, or whatever chocolate you’re using, I find hereshy is the best dimensions to do this with and it’s the “go to” s’more chocolate. I like to use dark chocolate sometimes just to make it a little different. So it’s like a chocolate sandwich, the marshmallow will be added later. Spread the fork ends apart a little bit, don’t worry its quality stainless steel and can handle just a slight stretch, but don’t over bend it otherwise you’re “s’more sandwich” won’t stay on. 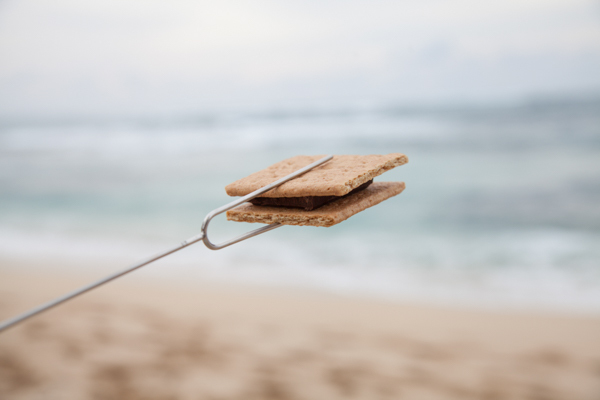 Slide the graham crackers on opposite direction of the natural crease in the crackers otherwise, it will split. 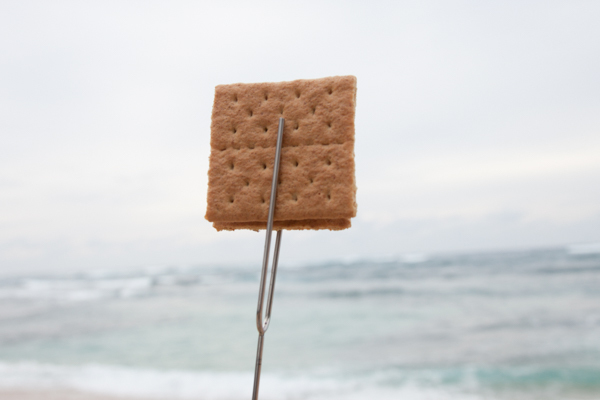 Once it’s secure you should be able to rotate the fork as normal and start toasting the complete s’more! The key is don’t let the chocolate melt too much because it will all fall in the campfire. Usually, the when done right it all gets done at the same time. Then open it up carefully so the chocolate doesn’t run off then slide the marshmallow off the fork with the already made melted chocolate “s’more sandwich”. To get rid of the gooey mess just burn it off in the fire. The fork is stainless steel, it can handle! 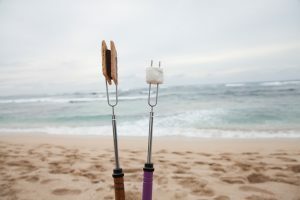 If you do still want to burn your marshmallow or you just want to look super cool to be double wielding 2 Rolla Roasters while at the campfire, then you can divide these 2 processes up. This style of s’more roasting doesn’t work on the Rolla Roaster Folding fork but we’ll post a different custom recipe for that one later! Anyone else have a campfire cooking inventions to share? Please let us know in the comments! Happy campfire cooking everyone! For more s’more making tips look no further than the pro-chocolate makers Hershey. Here is a link to their s’mores recipe.